A volunteer litter picker has expressed his concern for Houghton Regis Chalk Pit. Following a weekend of glorious sunshine, many people took to the Chalk Pit to spend time lazing by the side of the Marl Lark, including students from All Saints Academy. But as the crowd left the site, some of the litter did not leave with them. A regular concerned visitor, who has worked tirelessly as one of the volunteers to help keep the site free from litter for several years has told HRND on Monday morning, "I've been down there this morning and I'm very sad. 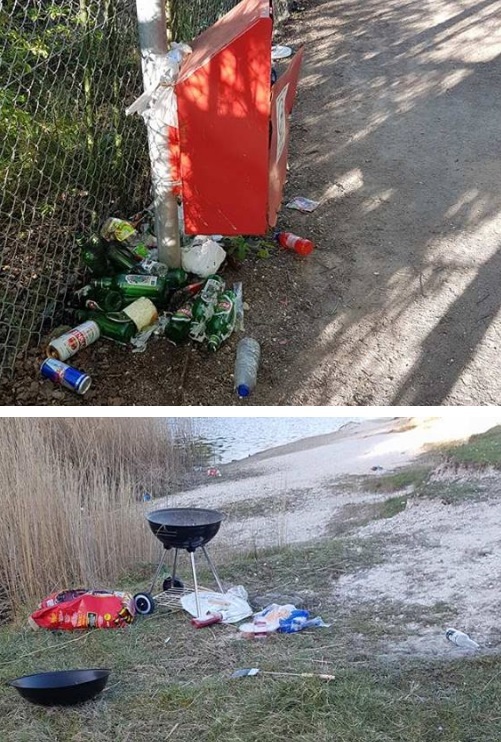 I litter-picked around the lake between 1pm and 2pm yesterday. I went down there this morning, and the amount of rubbish left in just half a day is heart-breaking. I didn't have enough time or bags to clear-up today. I fear the place is lost to legitimate public use for the next 3 or 4 years." The volunteer preferred not to be named, but supplied the pictures above. Funding to manage the privately owned site was provided by St Francis Group, the site owners, for 5 years, when new homes were built at Lake View, but this has run out, and management by BCN Wildlife Trust officially ceases later this week. The St Francis Group describes itself as an innovative owner, manager and developer of commercial and residential property. New funding to help manage the Chalk Pit - a Site of Special Scientific Interest (SSSI) - is not expected to start until new homes are built at Thorn and west Bidwell, to the north of the chalk pit. With Central Bedfordshire budgets being quite tight, HRND understands that interim funding from the authority might be difficult to find. Recently, some metal gates from nearby Blue Waters Woodland were stolen, and to replace those is another expense the budget of the relevant department of the unitary authority will need to meet. Would you like to help in specific clean-up-the-pit days? If there is enough support, we could organise this through HRND. Contact us.